A charm quilt is made up all of one tessellating patch where each patch is a unique fabric. I belonged to the Thunder Bay Quilt Guild when some of the members of the group did a charm exchange. Eighteen of us exchanged 10 squares of fabric in an assigned color range every other month for one year. Using these squares and adding a few from my stash, I ended up with 1089 unique 5 inch squares of fabric used in my charm quilt. I used a tessellating whirly-gig type shape and arranged them in a Trip-Around-the-World configuration. 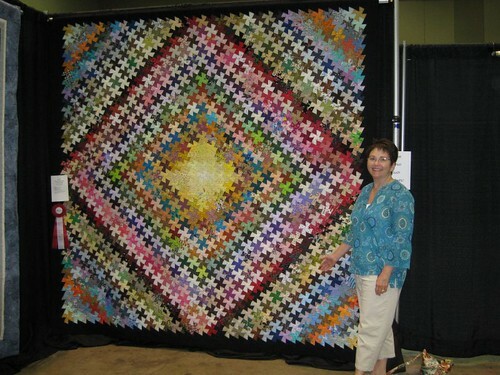 Here I am at the 2009 Michigan Quilt Network where the quilt won a 2nd place ribbon in the “Large Machine Quilted” category. With the whirly-gig shape I used, there were little squares of leftover fabric, so I made this smaller charm quilt of squares using the same 1089 fabrics! 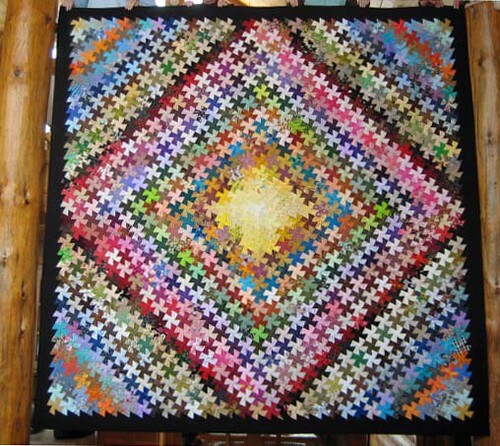 This entry was posted in Quilting, Thunder Bay Charm Quilt. Bookmark the permalink. 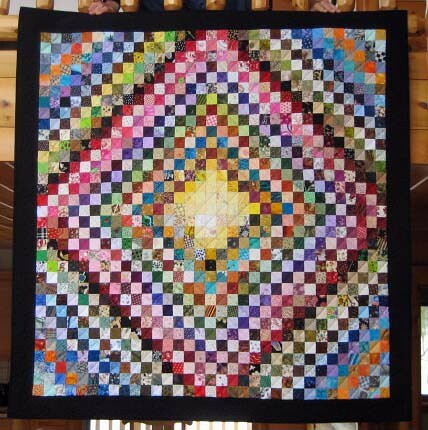 Gorgeous quilt!!! Congratulations on your second place! the transformation is amazing! I’ve never seen a large quilt sewn that way and there might be reason. It is beautiful!!! !